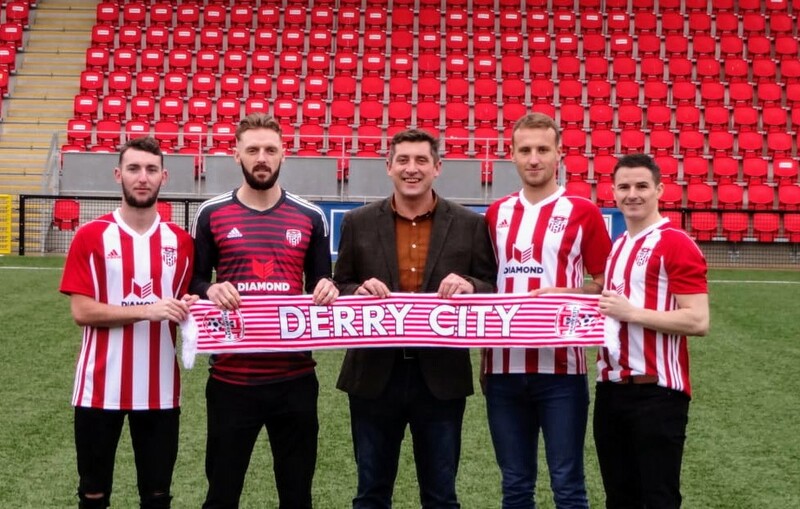 Declan Devine has made his first significant additions since returning to the Brandywell hot seat, with three new faces joining the club. Goalkeeper Peter Cherrie joins the Candystripes having spent the 2018 season on the books of Cork City. The 35 year old Scot has spent nearly a decade in the League of Ireland, having spent time with Airdrie, Ayr and Clyde in his native Scotland. Cherrie played with Dundalk for over five years where he picked up the League title and FAI Cup. He was also nominated for Goalkeeper of the Year. Cherrie moved to the Irish League for a brief spell with Cliftonville, before returning to the League of Ireland in July 2015 to join Bray Wanderers. He played with Bray until the conclusion of the 2017 season before moving to Leeside. He found his game time limited for Cork, but appeared in the Europa League games and other key fixtures for Cork. He was in nets for Cork for their 3-0 victory against Derry in October 2018 and made 7 appearances in total for Cork City during the 2018 season. He has made over 260 appearances for Dundalk, Bray and Cork during his time and in the Brandywell he will battle it out with Nathan Gartside for the number one spot. Ciaran Coll joins from Finn Harps where he was integral in the side that won promotion in the 2018 season, which coincided with his testimonial year at the Ballybofey club. The 27 year old started his career at underage level with Hearts in the SPL before joining Harps. The defender has been a key part of the defensive unit at the Donegal side for most of the last decade, appearing over 270 times. The experienced defender can play at either full back or centre half and will add vast experience to the City back line as they look to close the gaps which led to a record number of goals conceded in the 2018 season. Another addition to the defensive line is Ally Gilchrist, the Scot having spent last season with Shamrock Rovers. The 23 year old centre half started his career with St Johnstone. He was unable to breakthrough, despite loan spells at both Edinburgh and Elgin City. He made the switch to the League of Ireland in Jan 2018 when he signed for Shamrock Rovers. He made 13 appearances for the Hoops in the 2018 season before leaving the Tallaght club at the end of last season. The club are delighted to announce that Jamie McDonagh has opted to extend his stay at Brandywell, with the U-21 international extending his stay at Brandywell. The 22 year old signed from Sligo Rovers at the end of the 2017 season and spent most of the 2018 season on the right hand side at wing back or on the right hand side of midfield. McDonagh made 38 appearances across all competitions in the 2018 season. We will be catching up with the new faces over the next few days about their hopes for their time on Foyleside and their thoughts ahead of the 2019 season.